The members of Kairos Ensemble met in the early 90's whilst studying music at the Royal Academy of Music and City University in London, forming the quartet in 2001. Their extensive live work has included jazz concerts, workshops and tours. They have released four albums, their most recent being Rejoicing Blues (2013) which received a very warm reception from DJs, reviewers and the general public alike. Passion Suite (2010) was described by Julian Joseph on Radio 3's Jazz Line-Up as “beautiful music” and was performed live for a Jazz Services tour. Before that came Psalms (2006) and The River (2002). Their music reflects the breadth of the individual players' experience and captures a vibrant chemistry between the musicians. Through their strongly melodic and inventive compositions and arrangements, they produce music that is passionate, lyrical and always engaging. 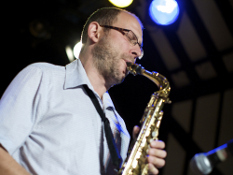 Saxophonist Dan Foster grew up i n Newcastle and studied jazz at the Royal Academy of Music. Playing credits include Alex Wilson, Pasadena Roof Orchestra, the London Jazz Orchestra, David Byrne, Tony Hadley, John Etheridge, Mike Garrick, Graham Kendrick, Freeform Five, Freaks, Five Star Swing and many more. Early inspiration on the saxophone came from the likes of jazz greats, Charlie Parker and Cannonball Adderley. Dan describes the development of his musical voice as an “on going journey” and he is keen to continue developing his musical voice. He is also a Baptist minister and lives with his family in Pembury, Kent. Originally from Scarborough, North Yorkshire, prolific and award-winning pianist/composer Peter James studied jazz at the Royal Academy of Music. 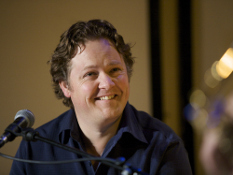 Peter’s compositions have featured on a number of Christian Garrick albums and his extended work Passion Suite for Kairos Ensemble was toured with Jazz UK funding in 2008. Peter also heads up his own trio whose latest release, Soul Story, was listed amongst Jamie Cullum's best albums of the year on Radio 2, as well among the top recommendations in Jazzwise magazine. Peter’s current work also includes teaching, playing twice a week at Fortnum and Mason's and working on his next trio album. Richard Fox’s education, including time at both the Guildhall School of Music and City University, led him to develop interests in many areas of music, ranging from jazz and World Music to the classical repertoire. 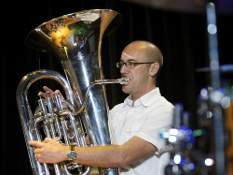 This has equipped him to perform with a wide variety of artists and ensembles including Snarky Puppy, the London Sinfonietta, Paul Whiteman Orchestra, The Brasshoppers, English National Opera, June Tabor and the Creative Jazz Orchestra, Billy Cobham and the Philharmonia. Richard is married, has two beautiful daughters and lives in Surrey where he also pastors a church. 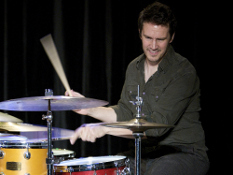 Versatile drummer Tom Hooper began to play professionally at 14 years of age in Cornwall. In 1991 he moved to London to study Jazz at the Royal Academy of Music. He is a member of the Peter James Trio and first call drummer for the internationally acclaimed jazz violinist, Christian Garrick. Tom's freelance work has included playing for the Dutch singer Jan Smit, on Grace Jones' highly regarded album 'Hurricane', for Simple Minds, Brian McFadden, Johnny Dankworth, up and coming singer George Montague and many others.